The controversy of two Hindu girls missing is getting complicated with each passing day. According to the family, the teenage girls Reena and Ravina were missing from Dharki in Ghoti district of Sindh and forcefully converted to Islam before they were subjected to underage marriage. The father and brother of two girls shared the details in a video that went viral on social media. On 22nd March, the girls released a separate video in which they revealed that they accepted Islam on their own will. Reciting Kalama-e-Tayyab, the girls were seen sitting comfortably and said that they are seeking protection from a court in Bahawalpur. In another video, a cleric can be seen next to the girls and two men who they were married to. The cleric says the girls were inspired by Islam and alleges that their family is spreading “false propaganda” and is frightening them. However, Prime Minister Imran Khan has directed CM Punjab Usman Buzdar and government of Sindh to probe into the carrying of Hindu girls and to take immediate action. Till the final reports, the girls have been taken to Rahim Yar Khan. 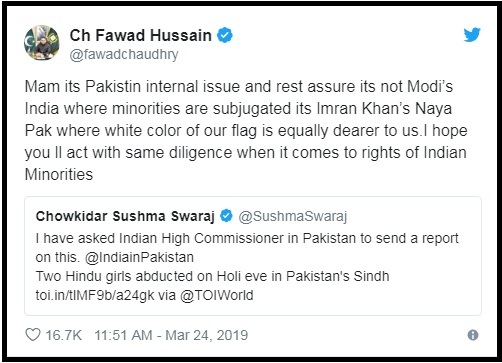 Talking about the protection of minorities in Pakistan, Information Minister Fawad Chaudhary and India’s Minister for External Affairs Sushma Swaraj exchanged words on Twitter. Responding to Sushma, Fawad said that it is our internal matter. “It’s not Modi’s India where minorities are subjugated its Imran Khan’s Naya Pak where the white color of our flag is equally dearer to us. I hope you ll act with the same diligence when it comes to rights of Indian Minorities”, said Fawad in his tweet. 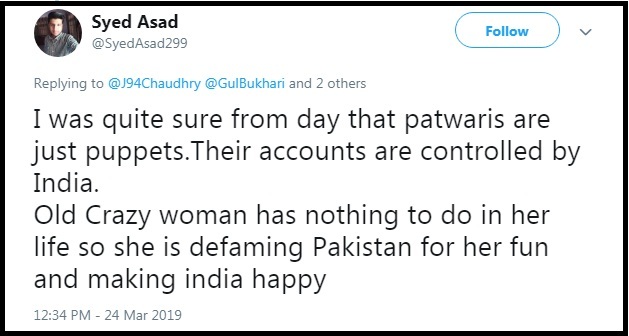 Journalist And Activist Gul Bukhari Shared Her Two Cents On Hindu Girls Controversy But People Didn’t Seem Happy With Her! Gul Bukhari shared a picture where Imran Khan is taking a formal meal along with his famous influential personality in Sindh with a ruthless caption. The picture is three years old when Imran Khan invited Mian Mithu at Bani Gala for issuing him the party ticket but following the criticism, Imran Khan didn’t do so. Well, Do You Know Who Is Mian Mithu? The Pir of Bharchoondi Sharif Dharki, Pir Abdul Haq alias Mian Mithu, who is criticized for alleged forced conversions of Hindu girls has asked for the party ticket from Pakistan Peoples Party, Pakistan Tehreeke Insaf and Grand Democratic Alliance various times but he has been denied every time. An influential religious and political person of Sindh has asked for the party ticket in 2016 but his meeting with Imran Khan in Bani Gala resulted in a fail bid. People On Social Media Criticized Gul Bukhari For Linking The Recent Event With Imran Khan’s Past! 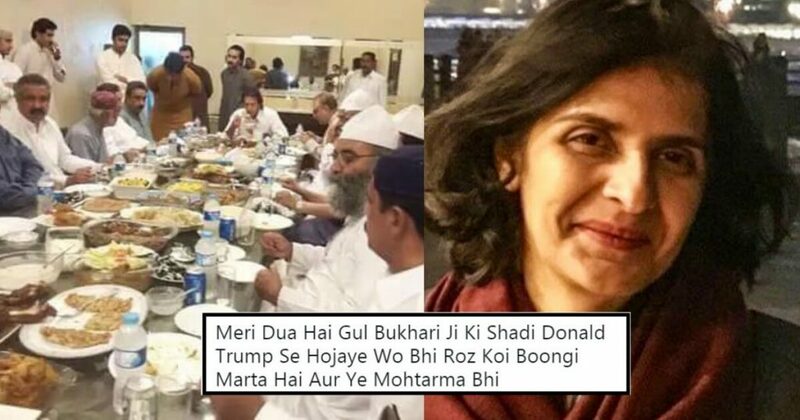 A Social Media User Suggested Gul To Marry Donald Trump! More Details Of Gul Bukhari!